Lesbian, Gay, Bisexual and Transgender (LGBT) older adults in the U.S. are at the nexus of two highly visible national trends. The first trend is demographic: every day, 10,000 people turn 65, a shift that will rapidly age this country and dramatically impact the lives of LGBT people who often grow older without sufficient supports, resources or rights. The second trend is cultural: as LGBT people gradually achieve significant (though limited and not yet equal) legal rights, making it easier for certain segments to live openly as LGBT people, the public has become increasingly allied with their LGBT family members and friends, and invested in the LGBT experience. Yet while these two trends have magnified the visibility of aging in America, as well as the barriers affecting LGBT people, the relationship between aging and LGBT life remains largely understudied. 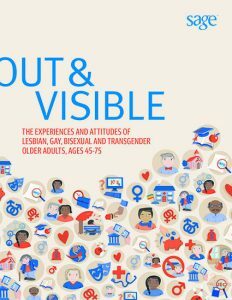 This study seeks to make more visible the concerns and aspirations of LGBT older people across the spectrum.